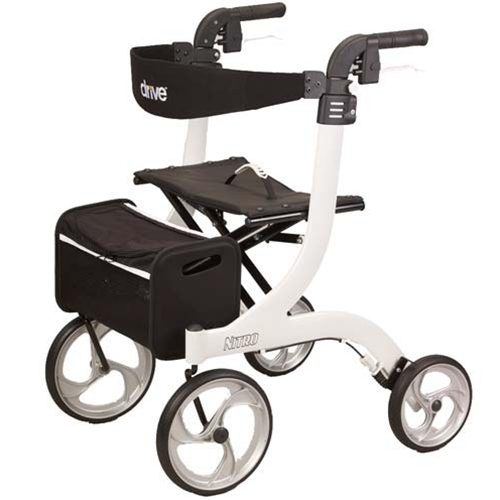 Drive Medical Nitro Rollator from HealthyKin.com features an attractive, Euro-style design. The brake cable is located inside the frame for added safety. The handle height easily adjusts with a unique push button. A caster fork design enhances the turning radius. 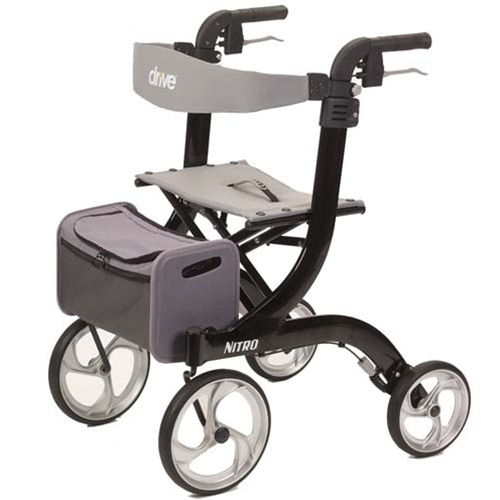 The Drive Nitro Rollator features large 10" front casters for easy maneuverability and indoor or outdoor use. It easily folds with one hand to ultra-compact size for storage and transport. A plastic clip holds the Drive Nitro closed when the frame is folded. The back support height easily adjusts with a tool-free thumb screw. The cross brace design allows for side-to-side folding and added stability. The frame can be folded with one hand for ultra compact storage and portability. A unique bag attachment keeps the included storage bag securely in place when the rollator is open or folded. our 2nd one...one for upstairs, one for downstairs and outside...a well designed product...assembly was a shap! just take it out of box! 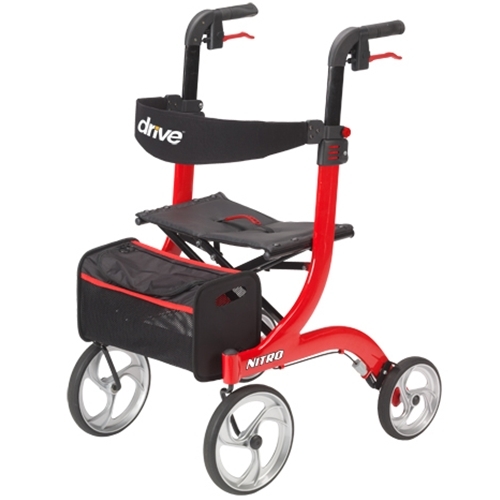 Drive Medical Nitro Rollator is the Lamborghini of walkers, period. I am really enjoying it. Much better for my posture than my old one. And everywhere I go I get compliments on it. Brakes work great too. arrived in excellent shape. Easy to assembly and easier to use and fold. Very sturdy but light for lifting into vehicle. easy to maneuver, especially in the house. Very pleased. Great walker. I bought it for my sister and she loves it. Easy to get in and out of the car. Very comfortable seat. The latch is a plus when transporting it. I sit on it too sometimes when we go shopping. You will love it! 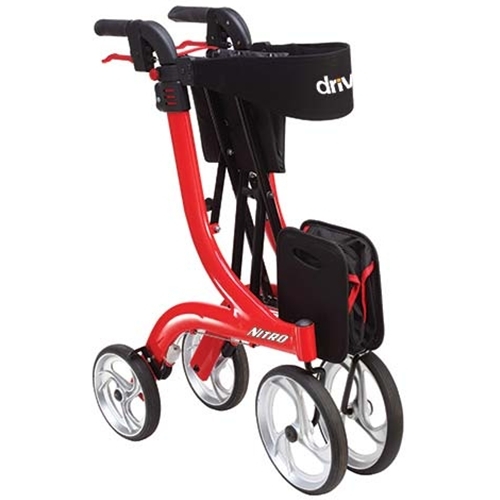 The Drive Nitro rollator is wonderful! It's not only great to look at, but it is the easiest to use. Right out of the box, it's ready to go. Best rollator I've ever had and used. (Best price too!) HealthyKin is the greatest company to deal with. Customer service is the best and the delivery time is amazingly quick. Thanks again! Reluctant hubby "bounded" with his red Nitro over Labor Day weekend. Cheers. It was super easy for him to use and since he needs to sit a lot, the sling chair is perfect for his compressed vertebrae problem and easy for me to fold and lift. Is just the right item as it adjusts to the individual needs with back and handles adjustable. The sharpest rollator out there!!! I get compliments everytime I use it, which is daily. Mine is white & black...very cool!